If you follow along with Chalkboard Nails on Facebook, you may know that I was toying with the idea of doing something angel wing related for today's theme, inspired by the supernatural. I tried it out and it wasn't translating well, so I decided to scrap that idea and come up with something new. 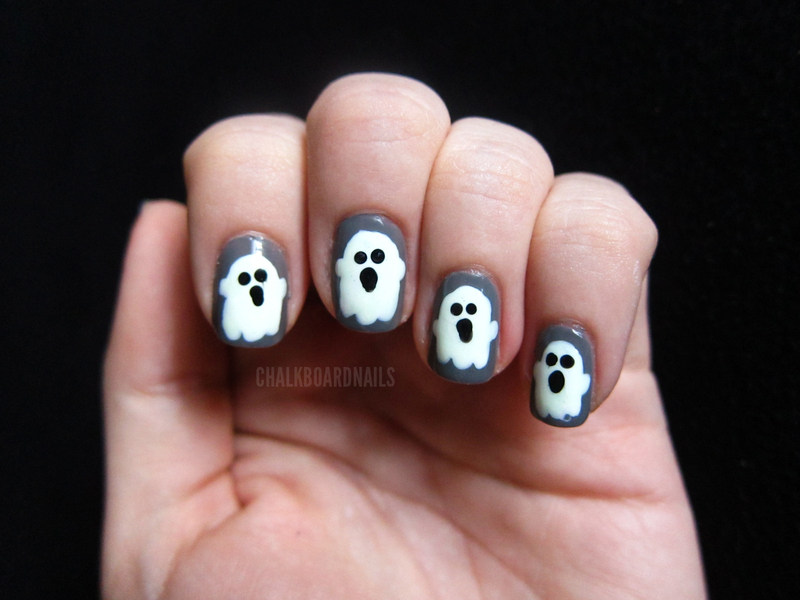 I went with cute little chubby ghosts! 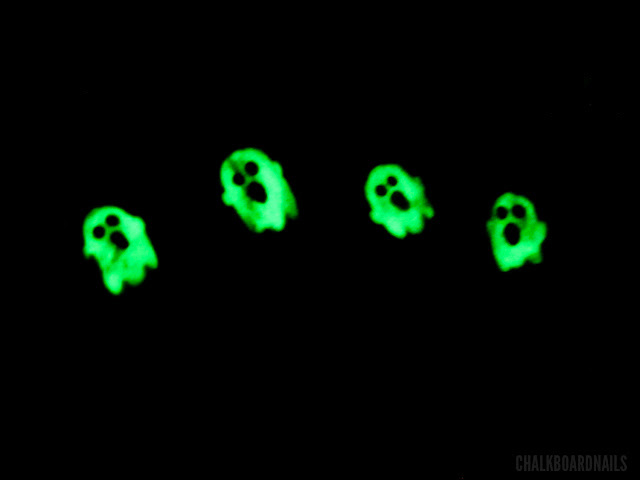 Here's the best part, I made them glow in the dark, like the creepy ghouls that they are! I started with a base of China Glaze Recycle. Then I freehanded some chunky little ghosts on in China Glaze White On White with the large and small ends of a dotting tool. I let that dry for a bit, and painted on a thick layer of China Glaze Ghoulish Glow with a nail art brush, which is a glow in the dark topcoat. Aren't they just so cute? They remind me of fat little marshmallows and I just want to squeeze them! I put the eyes and mouths on with the small end of a dotting tool, and used my go-to black of the moment, Wet N Wild Ink Well. I let that dry for a bit and then, of course, finished off the mani with Seche Vite. Let's all hug the ghosties together! These are so freakin awesome!!! In the dark and in the light! @Shally, I charge up my nails for a bit and then set both my camera and my hand flat on a counter, that keeps the image from becoming blurry from movement during the long exposure needed to capture the glow. And thank you, I'm glad you like these! @Fingers, Thank you so much haha don't you just want to hug them?? You've been doing such an amazing job during this whole challenge...I'm curious, how many hours do you spend a day this doing? I've really enjoyed everything! @Amanda, definitely, go right ahead and do this yourself! I probably spend about an hour a day doing this on average. Some manis take longer than others - like the Star Wars one took forever for example. This one was probably about 45 minutes. Ahhh! So cute! I love it. Great job! OH MY GOD! I am in love with these, they are toooo cute! This looks great! I wish I could find glow in the dark polish in my country! That is ADORABLE! I never would have thought to do it that way! you are so amazing with your nail art! i'm just learning and boy, do i have a ways go go! i just added you to my google reader so i'll never miss a creative mani! cheers! I read ALL of your posts and I must say that there have been HUGE improvement in such a short time - you are born to be nail designer :D lol. LOVE! I recently found you blog and I'm already a huge fan :) I'll have to take a thorough look through your full in the near future. 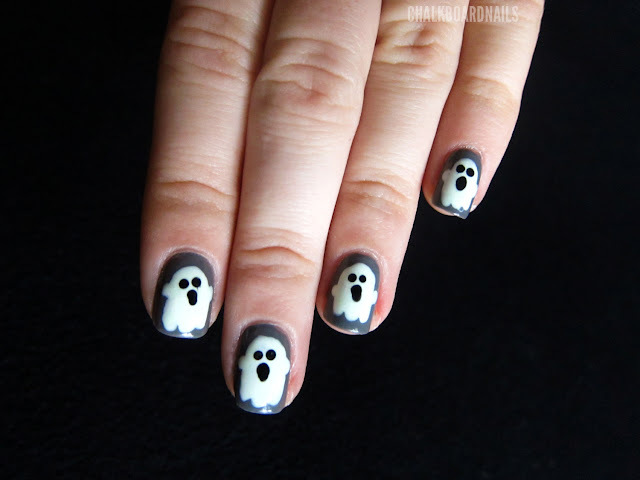 The little ghosties are cute, I'm trying to come up with some funky things to do with my glow in the dark polishes this Halloween. I've planned to make my blog 100% Halloween/Autumn themed for October :) Can't wait to see what you come up with. That is amazing! I'm a new follower, can't believe I've not seen your blog before now! So amazingly cute! Love it with this challenge too! The CUTEST chubby ghosts!!!!!! I LOVE this like no other! Too darn adorable! I love that they glow. They are just too cute and I am not one that 'goes' for a lot of the Halloween stuff - nails or whatever - and I should - it's my b'day! I wonder if Sally's has any of this glow in the dark polish left??? that is too cool!!! Love it!